Brad has been involved in athletics since he was a child. After graduating Florida State University with a degree in Sport Management, Brad moved to the Alpharetta area to continue his dream as a PGA golf professional. In 1997, he started a personal training business in Roswell. Brad developed a passion for helping people reach their fitness and athletic goals. In 2007, Brad attended a CrossFit level 1 seminar. 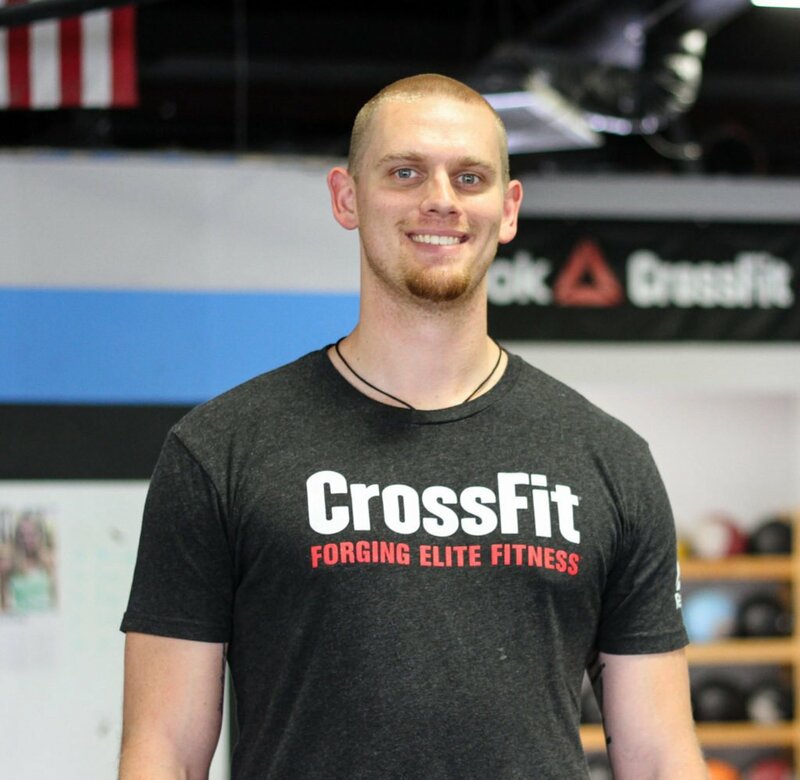 The seminar changed his vision on health and wellness and he opened CFNF shortly after attending the seminar and continues to help people reach their fitness goals and seeing them develop new relationships through CrossFit North Fulton. Brad’s speciality is coaching barbell movements. 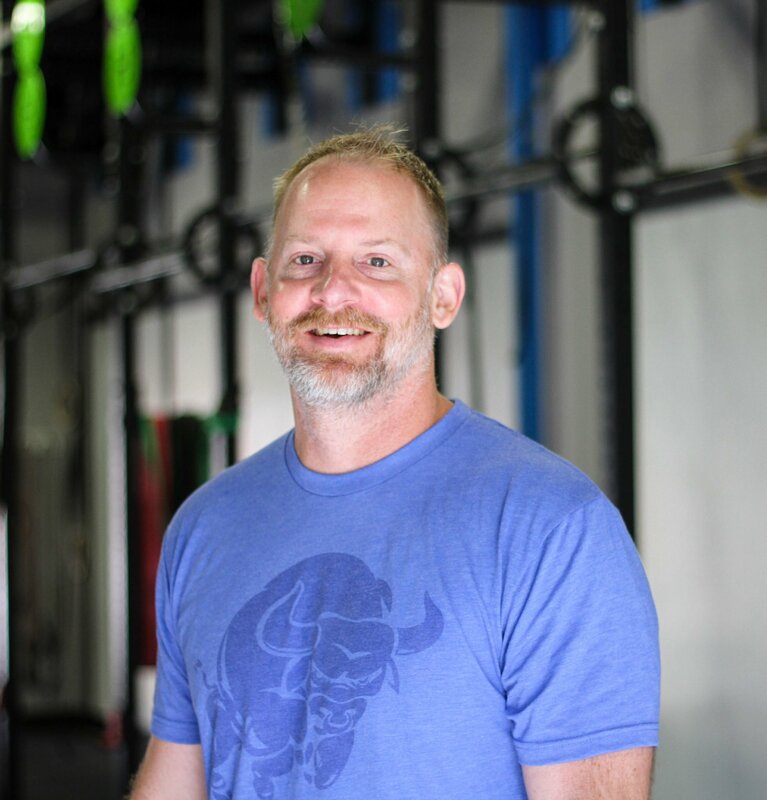 He is a Starting Strength Coach and is also a coach for the CrossFit Weightlifting Seminar. 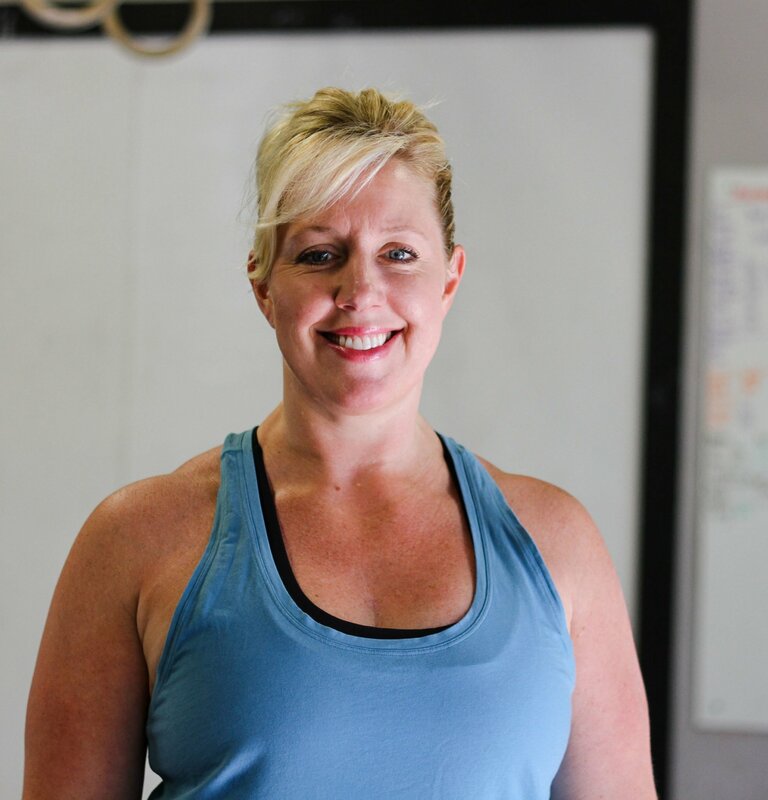 Kim Cantrell Trego began CrossFitting in 2007, has completed the L1 (twice), CFWL 1 & 2, and CF Scaling Course. Back in 2007, one of my personal training clients went to California and tried this "new" workout called CrossFit. I was intrigued. I had been personal training for many years at that time, and had not seen a universally scalable program like CrossFit. I really loved that these basic old school exercises were put together in a way to increase strength and work capacity simultaneously, and is scalable to all populations. I registered for a course immediately, and applied to become the first affiliate in Roswell, GA. Then I took every opportunity I could to learn more. 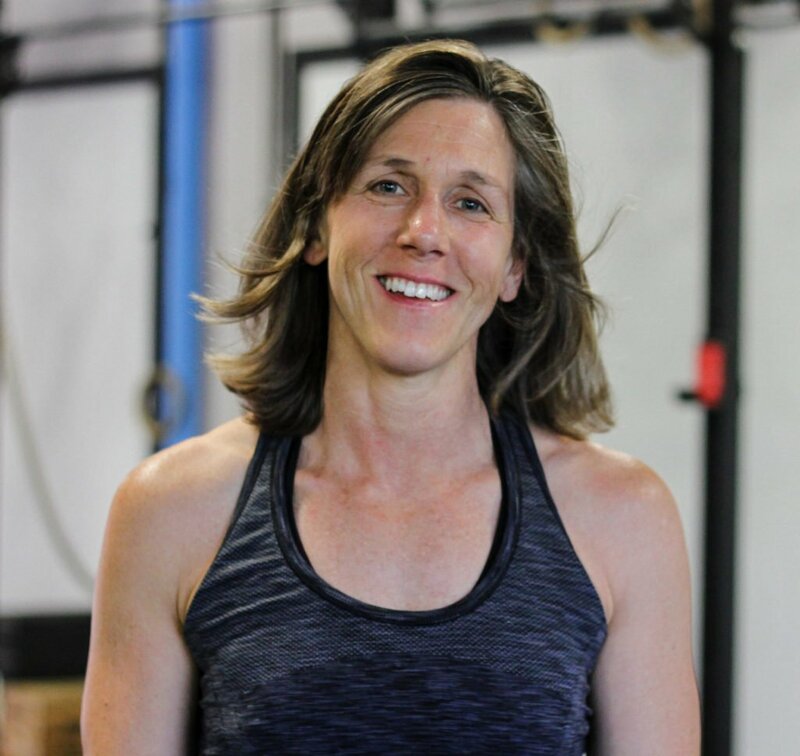 I have completed the USAW Sports Performance Certification, the CrossFit Weightlifting Specialty Courses, 1 & 2, and I also enjoy being a Head Regional Coach for the CrossFit Weightlifting Specialty Course. I have completed the OPEX (formerly OPT) Fitness Assessment and Program Design Course. I enjoy weightlifting, competing, giving people a great workout, and of course, my puppies! I am constantly striving to learn more in my industry. My next goal is to complete the FMS movement course to help my clients move better. I love fitness. I love to work out and teach others to do the same. It is one of my favorite things I get to do each day. I have a history of teaching group fitness and training people starting in high school and continued through college. I earned the title of Ms. South Carolina Bodybuilding in the 90s among other titles. 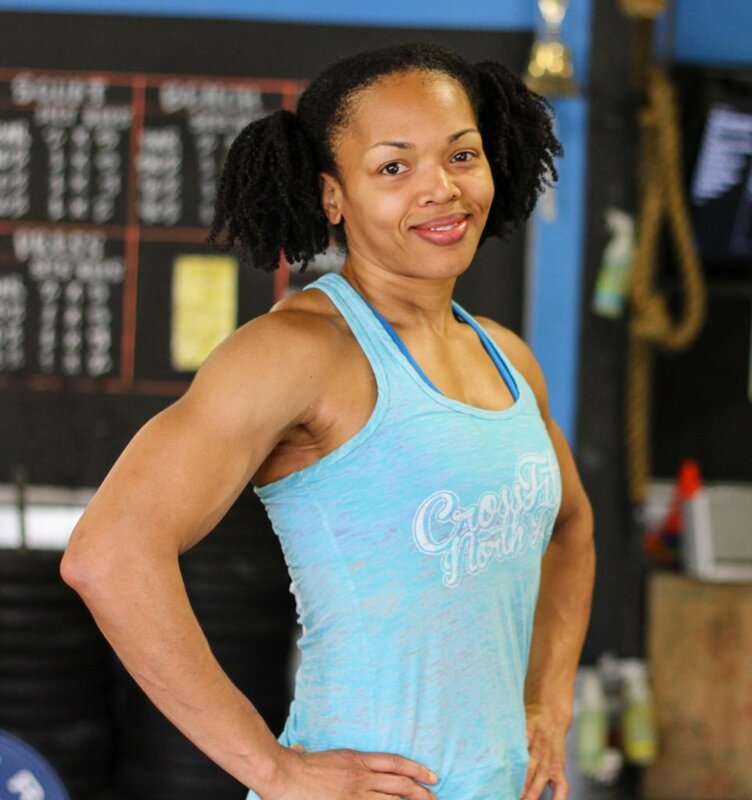 I enjoy competition and have earned titles at Olympic weightlifting meets, Power Lifting meets and local CrossFit competitions. 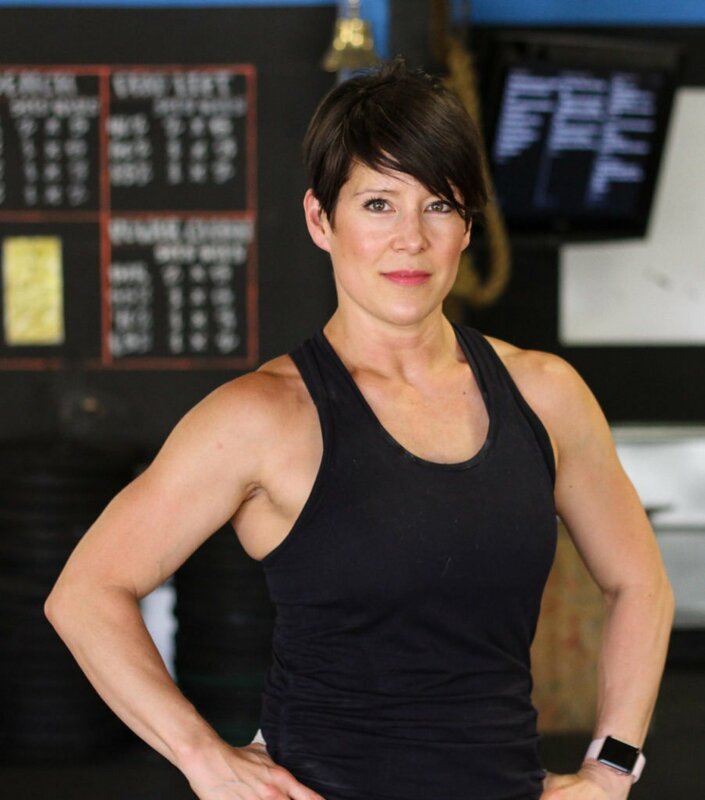 Upon returning to the fitness industry I got CrossFit Level 1 Certified, CrossFit Weightlifting Level 1 and Level 2 Certified, CrossFit Kids Certified among obtaining many other strength and nutrition certifications. I love to learn about nutrition and fitness. I take cooking classes health and nutrition classes and at home courses on anything that I think can make my family and clients healthier and perform better. If I’m not at the gym you will find me in the kitchen, coaching an off site boot camp or at one of my kid’s events. I’m married to my awesome husband Garrett and we have two boys Collin (16) and Ryan (12). I am also a Miracle League Softball Coach and am very involved in the Special Olympics as my oldest son is autistic. I spend lots of time with the Alpharetta Raider lacrosse program. My husband is a coach, my son Ryan plays and I have been the high school strength and conditioning coach in the off season.Go Raiders! I have always had an active interest in sports, nutrition and working out. In High School I played soccer and danced. While in college in Massachusetts, I worked at the YMCA working with new clients. For 2 1/2 years I was the Lead Cyclist Instructor with the outdoor cycling group for LifeTime in Alpharetta and completing several triathlons with my husband during that time as well. I have enjoyed doing CrossFit for 4 1/2 years and became a certified CF Level 1 coach. I love our CrossFit community because we support each other, cheer people on and help people become better. Outside of CrossFit, I enjoy hiking to waterfalls with my family and dogs, kayaking and watching football. Nate has been involved in athletics his entire life. Played 4 sports most of his life up through high school. He went on to play football at Averett University for four years and was named All-Conference as a senior. Although he left collegiate athletics in 2009, the drive to compete was still there. He began coaching and training high school athletes and would try to improve his personal fitness in between. In 2013, his best friend (CrossFit Coach, Charlotte) finally convinced him to try CrossFit after several years of attempts. He was immediately hooked and continues to love the challenges and camaraderie it creates. He strives to help people reach their fitness potential so they can experience life to fullest. Growing up I was never the athletic kid, quite opposite I was insecure about my body and never tried much in the sports area. I always thought though if I knew more about taking care of myself properly, it could help. In my early 20's I became very interested in nutrition and started dabbling into the exercise world. Astonished at what a difference nutrition made, I got my first personal training and nutrition coaching certification in 2002. Later I found what seemed to me a more challenging exercise experience through crossfit and also got my Crossfit Level 1 Trainer in 2012. It’s my passion to help people realize that being healthy, strong and fit is attainable for anyone who wants it. I also enjoy training the younger generation. They have so much potential. I feel getting them to experience the gains of strength and fitness can have a positive impact in their lives from an early age. I have 3 kids and understand trying to fit in fitness and training into an already overloaded schedule. Having the community here at Crossfit North Fulton makes that commitment to your health actually doable and you get the added benefit of relationships and friends that make you even better.